The New York Times is reporting that Kraftwerk are to play a series of concerts at the Museum of Modern Art (MoMA) in New York. According to the report, museum officials have said that the event will go under the banner of Kraftwerk-Retrospective 1 2 3 4 5 6 7 8 on consecutive evenings from April 10th. 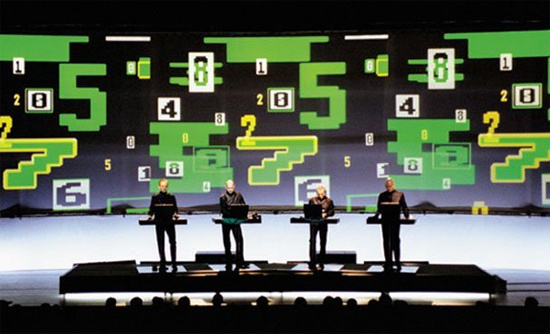 These, say the New York Times, "will feature not only tracks from one of Kraftwerk’s albums, but also other original compositions intended to showcase the group’s influence on contemporary culture. Projected images, including 3-D ones, will accompany the music. The albums will be performed in chronological order, one each night, starting with Autobahn from 1974 and working up through Tour de France from 2003." Tickets, apparently priced at a very reasonable $25, will go on sale from noon on February 22nd. UPDATE: Further information, including night-by-night details, ticket link and the news that the residency is sponsored by Volkswagen to be found at the MoMA website.